Jurassic World has broke world records as the highest grossing global premiere in history, earning over $500 million during its opening weekend. 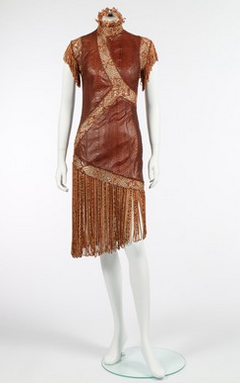 To celebrate, Barnebys takes a look at all things pre-historical. North Africa, Ca 70-65 million years old. 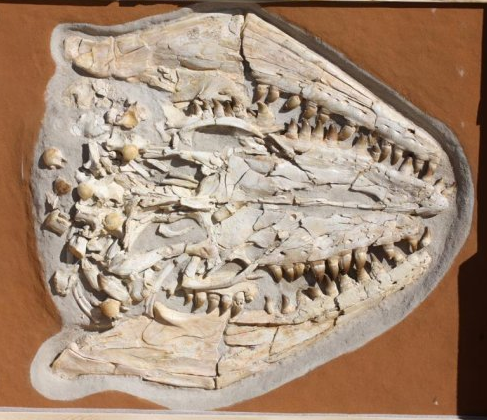 Mosasaurus ("lizard of the Meuse River") is a genus of Prognathodon, carnivorous, aquatic lizards, somewhat resembling flippered crocodiles, with elongated heavy jaws. The genus existed during the Maastrichtian age of the Cretaceous period (Mesozoic era), around 7065 million years ago in the area of modern Western Europe and North America. Keichousaurus is a genus of marine reptiles belonging to the family Pachypleurosauridae. That family became extinct towards the end of the Triassic during the Triassic Jurassic extinction. 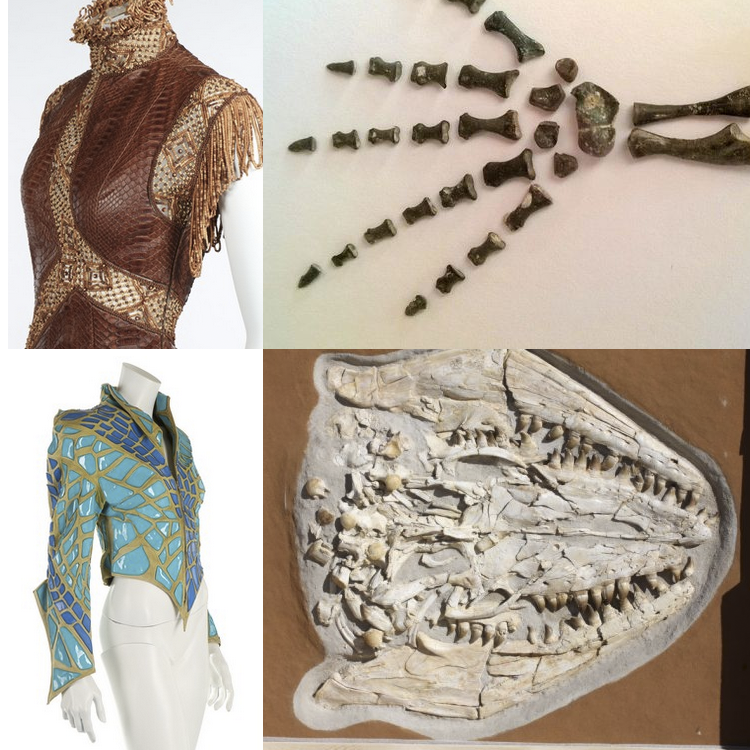 The name is derived from Kweichow (now the province of Guizhou) in China, where the first specimen of this fossil was discovered in 1957. Keichousaurus, like all sauropterygians, was highly adapted to the aquatic environment. Individuals of this genus ranged up to 15 - 30 cm long and had both long necks and long tails, with elongated, five-toed feet. The pointed head and sharp teeth in this genus also indicate that they were fish-eaters. 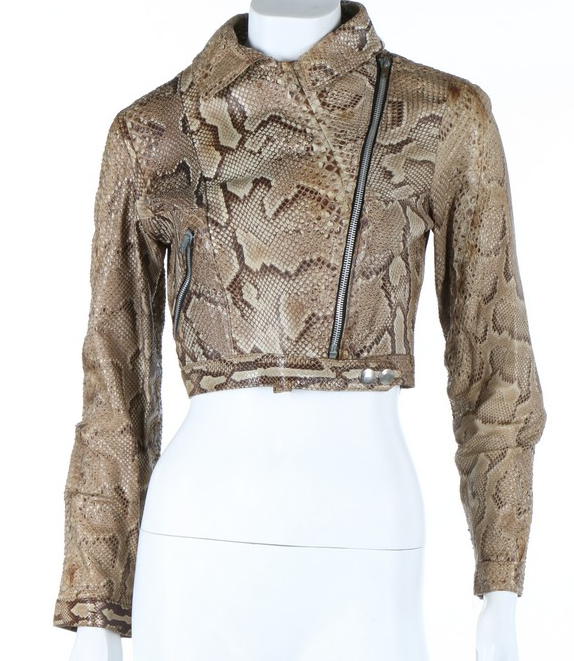 An Ossie Clark snakeskin rocker jacket, circa 1966-7. lycodonomorphus rufulus, un-labelled, zippered front side fastening, zips also to cuffs and front pocket, un-lined. 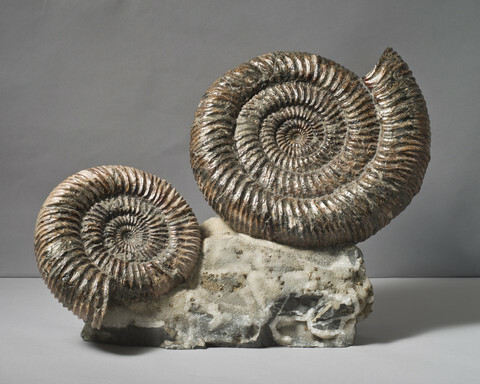 A fossilised ammonite pair, Upper Volga, Russia, Jurassic period (60 million years old), species Simberskitus. 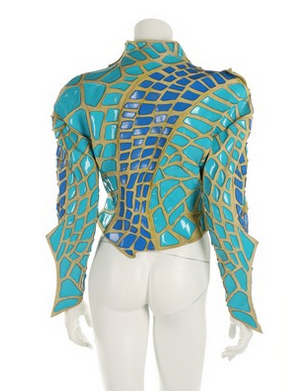 A Thierry Mugler 'Optisaurus' yellow suede jacket with turquoise and blue 'scales', Spring-Summer, 1989. blue label and size 36, with points to the waistline and collar, fins to the shoulder and cuffs, chest approx 86cm, 34in Literature: 'Thierry Mugler: Fashion, Fetish, Fantasy', edited by Claude Deloffre. 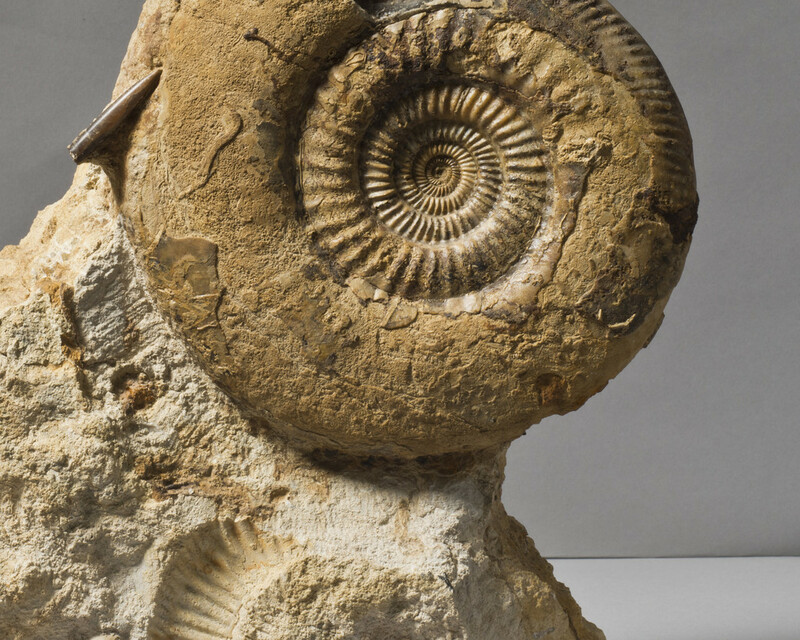 An English ammonite, Burton Bradstock, Dorset (Jurassic Coast), 204 million years old, on a sandstone matrix. 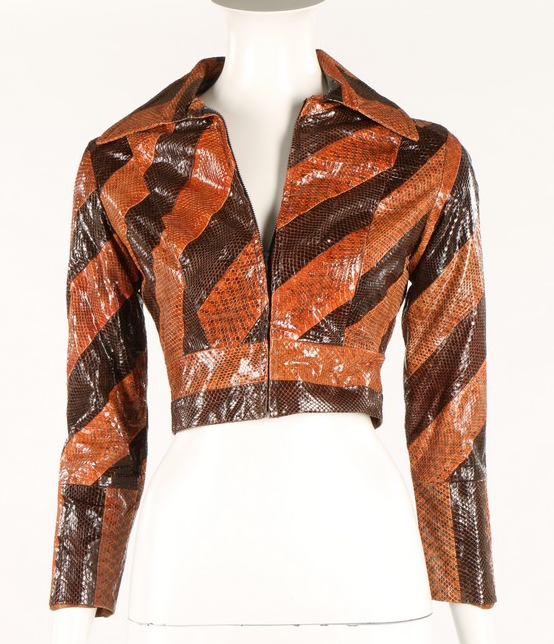 A fine Ossie Clark striped snakeskin 'Rocker' jacket, 1966-67. printed satin label, lycodonomorphus rufulus, of diagonally banded leather, zip fastened lined in brown satin, bust 81-86cm, 32-34in 'The Ossie Clark Diaries' edited by Henrietta Rous describes how Ossie discovered a stash of rolled un-used snakeskins in a warehouse. Ossie bought them cheaply and used them to make full length coats and tight little 'Rocker' jackets. 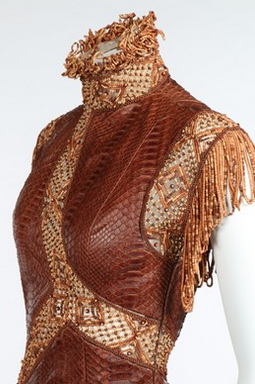 He wrote: 'They were exotic, with added glamour attached to wearing part of a dangerous animal and the association with fetish in clothing oneself in another creature's skin'. 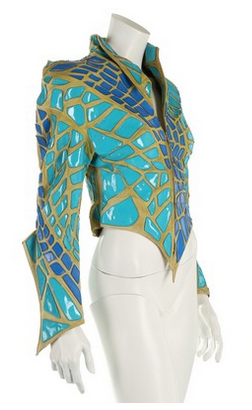 Twiggy, Britt Ekland and Verushka all wore them. 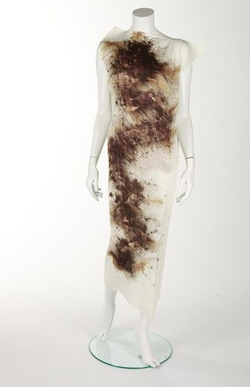 An Issey Miyake/Cai Guo-Qiang printed 'Dragon or Rainbow Serpent' dress, Guest Artist, Series 4, 1999. labelled, of pleated polyester with sinuous snaking pattern to front and back in shades of brown, blue and mauve, fin-like point to one shoulder and diagonal slope to the other, points to hem, bust approx 86-92cm, 34-36in This Chinese artist produces these prints/designs by means of detonating gun-powder charges on paper which leaves a residue of scorch marks and ash, reminiscent of traditional Chinese calligraphic ink drawings. The undulating lines are suggestive of serpents, Chinese dragons or snaking river paths. Captorhinus aguti was one of the first reptiles to live on land and originates from the Permian, approximately 280 million years ago. This made it the ancestor of several future reptiles and dinosaurs. By comparison, the T-Rex dinosaur, for example, dates from only 65 million years ago. Captorhinus aguti was both a herbivore and an insect-eating reptile, which becomes clear if you look at its teeth; the teeth at the back have grown together and were suited for masticating leaves and insects. Captorhinus aguti could grow up to 40 cm tall. 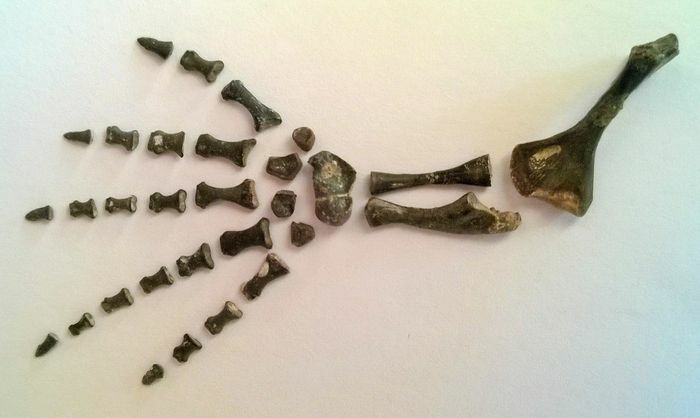 This complete Captorhinus aguti claw was found in Richards Spur, Oklahoma. Since restrictions have been imposed for the search for fossils in Richards Spur, it is very difficult to collect this kind of fossil material nowadays, which makes this item very rare.